It’s no secret that Halloween is one of my least favorite holidays. The stress of costumes has pretty much ruined it for me. I hate buying the plastic costumes from those big box stores. Yet, I can’t sew, so coming up with fun costumes every year has been the bane of my existence. We are finally at a place where my kids are old enough, that if they want to go out trick or treating with friends, then they have to MAKE their own costumes. Such a stress reliever for me. 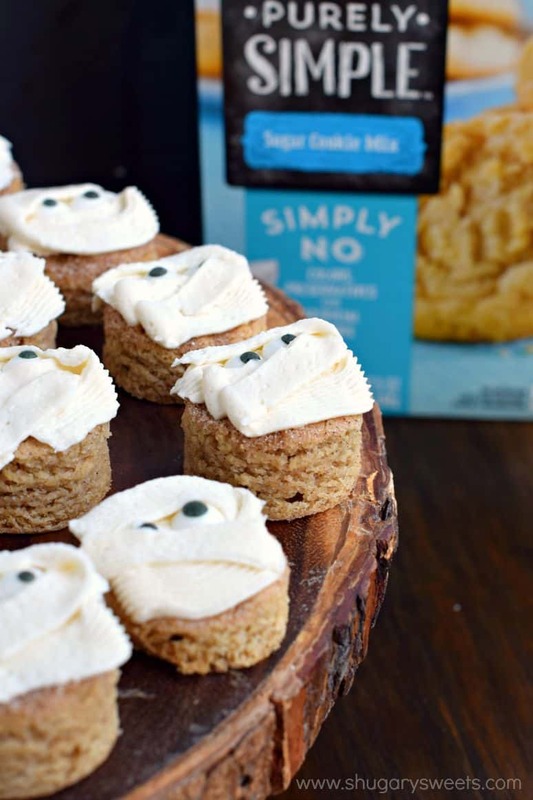 Now I can focus on creating fun Halloween themed treats, like these Snickerdoodle Blondie Bites. I’ve got a secret too, these blondies started from a box of Pillsbury Purely Simple Sugar Cookie Mix. You may remember earlier this spring I used the Pillsbury Purely Simple White Cake mix to make this delicious Coconut Cream Poke Cake! I love that these mixes have no color, preservatives or artificial flavor added! Making these bites are so easy. Mix up the ingredients for the blondies in a large bowl. 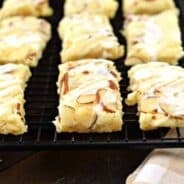 Spread the batter into a parchment paper lined 13×9 baking dish. Sprinkle the top generously with the cinnamon sugar mix!! If you prefer, you can just spread the frosting over the cooled snickerdoodle blondies, cut into squares and enjoy. OR…take it a step further to create a festive, fun holiday treat! I used a 1.5 inch circle cookie cutter to cut the shape out of the cooled blondies. I got about 3 dozen little circles in one pan. Whip up the buttercream frosting in your electric mixer. Add your frosting to a decorator bag with tip #48 (it’s the flat tip, with ridges on one side). Using a back and forth motion, make stripes on the cookie top resembling the cloth of a mummy. 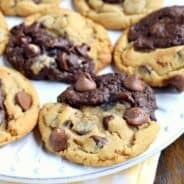 Press in some candy eyes (or chocolate chips). So easy, so fun! Know what else is fun? Being part of a blog hop with some of my favorite food bloggers! I packaged these mummy treats up and sent them over to Jamie from My Baking Addiction. And while Jamie got to indulge in some of my treats, I received a lovely package of Krispy Pumpkin Brownies from my friend Amanda from I Am Baker. Aren’t they amazing looking? Well, they taste even better than they look, if that’s even possible! 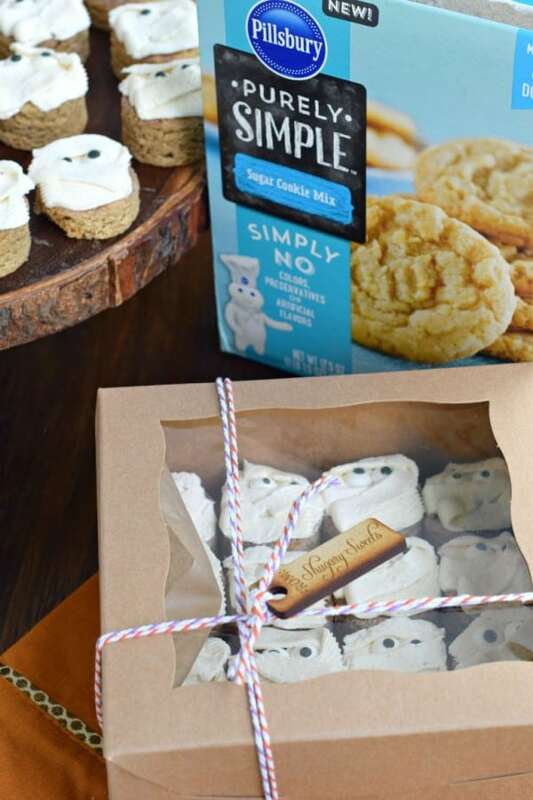 Be sure to go check out their fun recipes using Pillsbury Purely Simple mixes! Preheat oven to 350 degree F. Line a 13x9 baking dish with parchment paper. Set aside. In a mixing bowl, combine cookie mix with eggs, melted butter and cinnamon. Beat until fully combined. Spread in baking dish. In a little bowl, mix sugar and cinnamon. Sprinkle generously over top of unbaked blondies. Bake in oven for 22-25 minutes, until toothpick comes out clean. Set aside to cool completely. 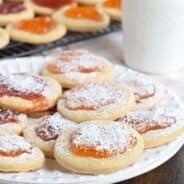 For the frosting, beat butter, powdered sugar, vanilla, and milk until fluffy and smooth, about 3-5 minutes. 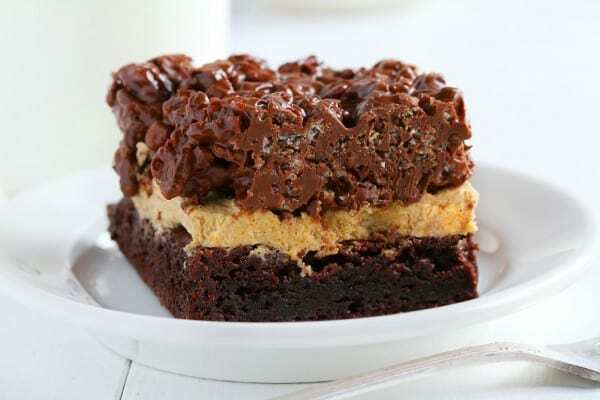 You can either spread frosting over cooled blondie bars and cut into squares. OR if you want to make the mummy bites, use a 1.5 inch cookie cutter to cut circles out of blondie bars. Add frosting to a decorator bag with tip #48. Pipe stripes back and forth over bites, and add monster eyes or chocolate chips for the mummy eyes. Store in airtight container. ENJOY. Okay, I’m with you on Halloween. I really don’t like opening my door and seeing scary people on the other side. It goes against all my self-preservation instincts. And these scary people want to take my candy away from me. What gives?! These are the cutest darn blondie bites I’ve ever seen. Who knew a mummy could be cute? You nailed it! These are adorable. Those eyes peeking out of the box? Ridiculously cute. Now about Halloween….or Hallooweener around here because we have Dachshunds who we dress up in costumes. We love dressing up! I hit up the thrift stores in the summer. You should see the velvet coat I got my husband as he is going to be Prince Charming. And the 3 girls are going to be Snow Whites with dad the prince. Can’t wait!! I swear the little eyes need to be a part of every holiday! I’ve been eyeing these mixes in the baking aisle. I will have to try it! These are so adorable Aimee (and so yummy looking too)! I could not agree more about Halloween! 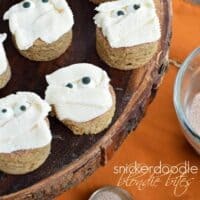 These snickerdoodle bites are seriously adorable and fun and I love them! These are seriously so cute! 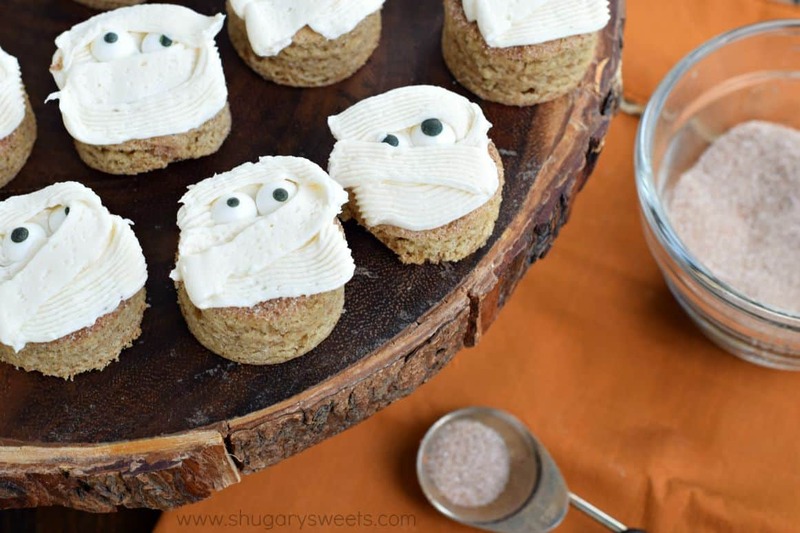 You know how I feel about googly eyed treats!!!! Love these! I’ll admit that Halloween is one of my favorite holidays because it gives my husband and I an excuse to dress up in goofy costumes. But I totally get your stress about the costumes – I’m not a sewer, either! 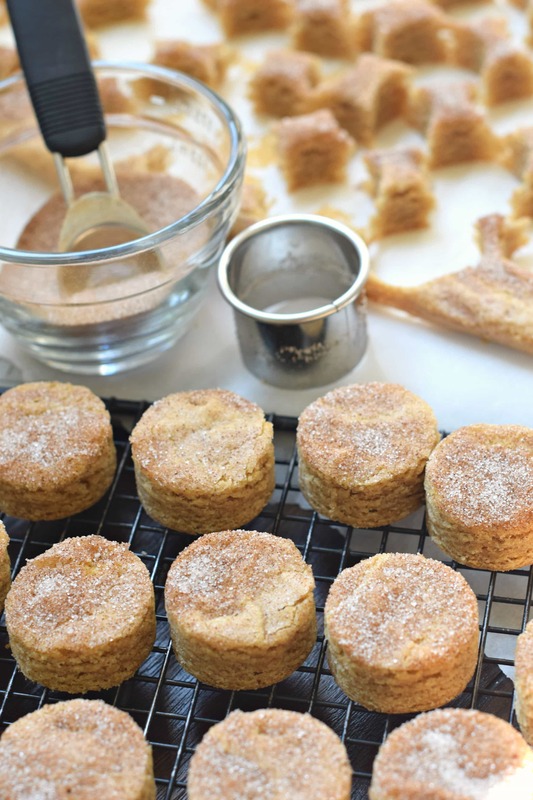 These snickerdoodle bites are perfect for anytime of the year! 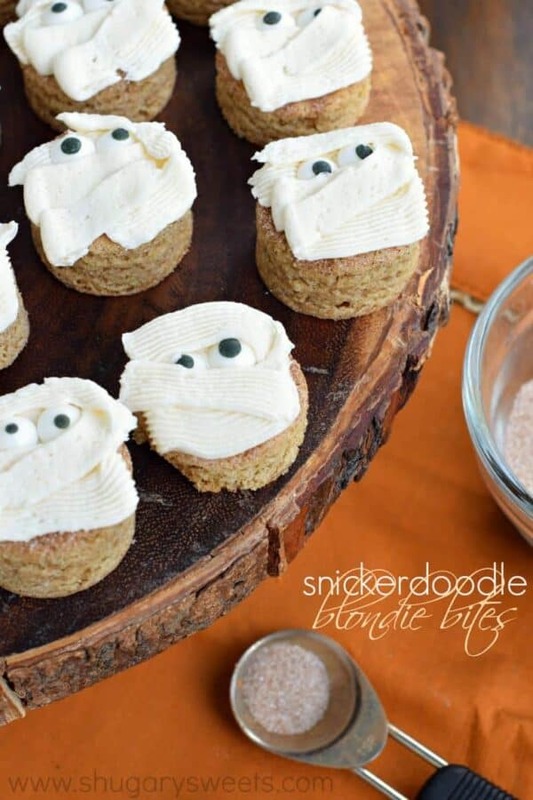 These are so fun and adorable, err…I mean spooky? Love it! I will have to look for this Purely Simple mix next time I’m grocery shopping. These are so super cute! Oh these are SO fun! Love it. And love me some snickerdoodles. These are absolutely adorable! And those blondies baked up super thick–love!